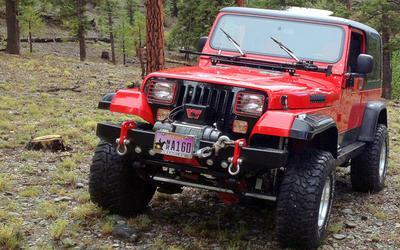 1994 YJ Bantum Updated photo. 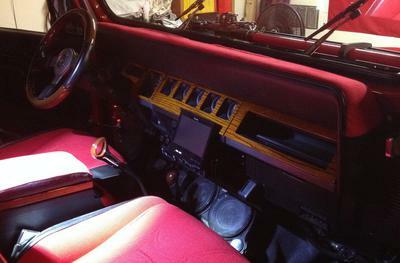 Inside dash and sound system. I have added an ATK 4.7L Stroker Engine. The Engine with all modifications and extras DYNO's right around 265-268 Horse Power. It now has front and rear custom Currie Dana 44 differentials with 4.56 G2 Gears, chrome moly axles, and ARB Lockers. Also has a Pioneer retractable 4 by 7 inch LED sound system head unit, and a rear LED behind the drivers headrest. Editor's Comment: All I can say is "WOW" Steve. 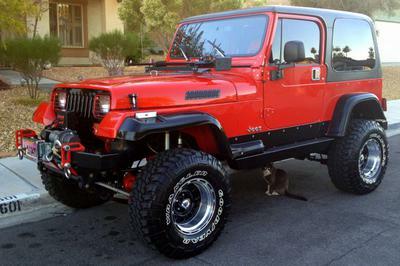 Your '94 Wrangler is one of, if not the nicest YJ's I've ever seen. You have built a really super ride, and some of the extra touches are really cool. The two sun roofs on the hard top look great...and the hood vents look good as well. 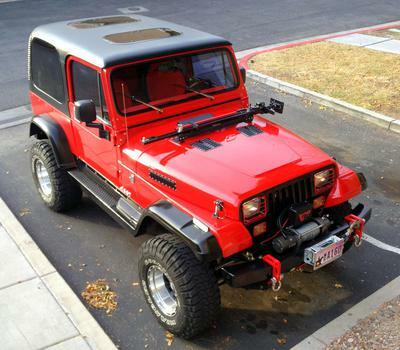 I would like to know more about how you did the sun tops and the hood vents (thinking about doing something like this on my '95 YJ). The dash and interior look to have some custom touches as well. Very nicely done and something to be proud of. What brand are your louvers?